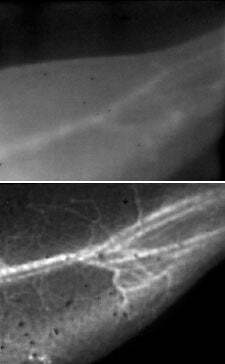 These images of a mouse’s blood vessels show the difference in resolution between traditional near-infrared fluorescence imaging (top) and Stanford’s new NIR-II technique (bottom). Stanford scientists have developed a fluorescence imaging technique that allows them to view the pulsing blood vessels of living animals with unprecedented clarity. Compared with conventional imaging techniques, the increase in sharpness is akin to wiping fog off your glasses. The technique, called near infrared-II imaging, or NIR-II, involves first injecting water-soluble carbon nanotubes into the living subject’s bloodstream. The researchers then shine a laser (its light is in the near-infrared range, a wavelength of about 0.8 micron) over the subject; in this case, a mouse. The light causes the specially designed nanotubes to fluoresce at a longer wavelength of 1-1.4 microns, which is then detected to determine the blood vessels’ structure. That the nanotubes fluoresce at substantially longer wavelengths than conventional imaging techniques is critical in achieving the stunningly clear images of the tiny blood vessels: longer wavelength light scatters less, and thus creates sharper images of the vessels. Another benefit of detecting such long wavelength light is that the detector registers less background noise since the body does not does not produce autofluorescence in this wavelength range. In addition to providing fine details, the technique – developed by Stanford scientists Hongjie Dai, professor of chemistry; John Cooke, professor of cardiovascular medicine; and Ngan Huang, acting assistant professor of cardiothoracic surgery – has a fast image acquisition rate, allowing researchers to measure blood flow in near real time. The ability to obtain both blood flow information and blood vessel clarity was not previously possible, and will be particularly useful in studying animal models of arterial disease, such as how blood flow is affected by the arterial blockages and constrictions that cause, among other things, strokes and heart attacks. 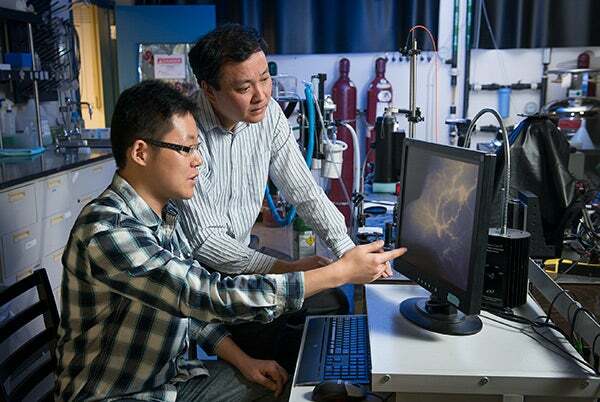 Graduate student Guosong Hong, left, and chemistry Professor Hongjie Dai look at the vascular structures in a mouse model of peripheral arterial disease with blood vessels shown in great detail using their new imaging technique called near-infrared II fluorescence imaging. Because NIR-II can only penetrate a centimeter, at most, into the body, it won’t replace other imaging techniques for humans, but it will be a powerful method for studying animal models by replacing or complementing X-ray, CT, MRI and laser Doppler techniques. The lead authors of the study are graduate student Guosong Hong of the Department of Chemistry and research assistant Jerry Lee of the School of Medicine. Other co-authors include graduate student Joshua Robinson and postdoctoral scholars Uwe Raaz and Liming Xie. The work was supported by the National Cancer Institute, the National Heart, Lung and Blood Institute and a Stanford Graduate Fellowship. The work was published online in Nature Medicine.